Jigs are probably the most versatile lure out there. With so many different shapes, sizes, styles, and ways to rig them, they can be used in almost every situation. They can be retrieved fast, or painstakingly slow. Actually, you can move them through the water just about any way you want. This makes them very useful for times when fish are finicky. They can even be trolled if that’s your style of fishing. 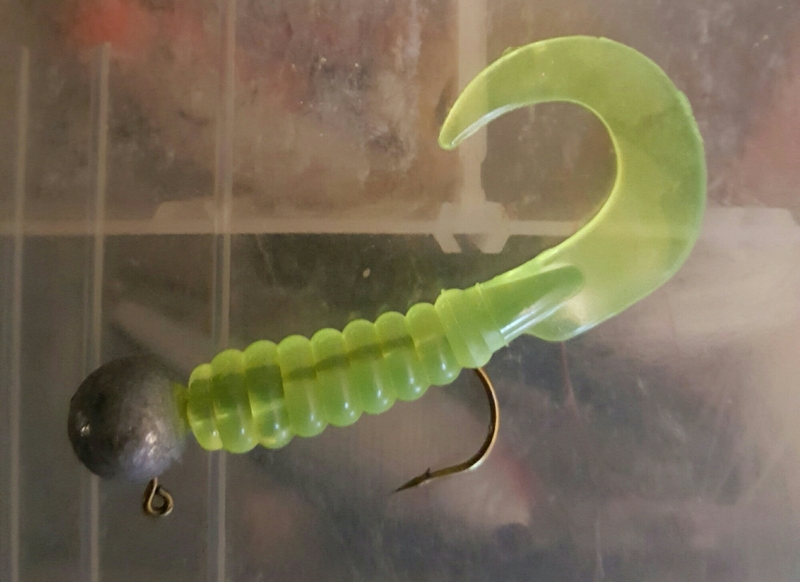 When I refer to jigs, I’m referring to a hook with a ball of lead attached for weight, and some kind of plastic body or live bait on the hook. One of the most common plastic bodies used is the curly tail grub. This design has been around for a long time, and still catches lots of fish. 3 inch baits seem to be most common. However, other sizes produce as well, sometimes better. A smaller offering can sometimes be the ticket to success. Larger baits are sometimes preferred and can even produce bigger fish. Swimbaits are another great option. The enticing wobble of these baits is out of this world. I’ve been using these baits for a long time now, but to this day I still take time to work them close to shore just to watch the incredible realistic action of these baits. I think the fish feel the same when they see them, but it definitely gives me a boost in confidence. Swimbaits also come in many sizes. I tend to use 2 and 3 inch swimbaits, but I also use them in 4 and 5 inch sizes, especially if I’m confident that trophy fish are in the area. Another choice is plastic jerkbaits. Plastic jerkbaits tend to be minnow shaped with a forked tail but also come in other shapes and sizes. At one particular location I know of, this is the go-to bait that alot of people use. When I use these baits, I retrieve them with sharp or subtle twitches to make the bait dart. Often, I allow them to fall to the bottom. There are many other types of jig bodies out there, far too many to cover, but these are some of the most common and the ones I’ve been successful with. Directly after Ice-out, I tend to use a lift and drop method. Slow lifts followed by dropping the rod downward while reeling in slack just enough to keep a tight line. I often pause at the end of the lift. The reason being that most times this is when the fish bite for me. Sometimes I even allow the bait to sit still on the bottom for a few seconds. Keeping bottom contact seems to be more important this time of year. Try different things and let the fish tell you what they want. Sometimes in cold water, the fish can be extremely finicky and the most subtle change in presentation can make all the difference. I’ll also do a slow steady retrieve this time of year. Just fast enough to give the bait some action. As the water warms, I use a steady retrieve more often, bumping bottom occasionally, but keeping the bait above the bottom. As the spring progresses, sometimes I burn them in with a fast steady retrieve with no bottom contact at all. This is one of my favorite ways to fish and I usually try this around late April to May. Trolling is another way to use jigs dressed with swimbaits or curly tail baits. Choosing the correct weight and speed to keep the bait near bottom has been the key for me. Try different sizes and speeds to find out what speed the fish prefer. Snagging is inevitable, but a small price to pay for the effectiveness of this tactic. When fall arrives and the water cools, I tend to go back to the slower presentations I use during ice-out, but not as soon as one would think. Agressive tactics still work for me during the fall at times and I always start out agressive first. As ice on gets closer, slower presentations become more common for me. Live bait is another option and sometimes it’s the best option. Tipping is the addition of live bait to a jig that already has a body on it. I use this technique for tougher bites. For me, using minnows is the best choice early and late in the year while nightcrawlers seem to work better for me during the warmer months. Live bait can also be used alone and sometimes this is what the fish prefers. Did I mention weight? In my opinion, weight is the most important factor of all. Keep a variety of sizes, from 1/32 to even 1/2 ounce. I myself have fished beside someone using a 1/16th ounce jig while I was using an 1/8th ounce jig. I couldn’t get a single bite while I watched this guy reel in four in a row. I immediately switched to a 1/16th ounce jig and started catching them as well. As a rule of thumb, I try to go with the lightest jig possible. But ultimately you just have to try different sizes to find out what the fish prefer. For me, once I find out what size the fish prefer, this size works for me year after year at that particular location, provided that I’m not fishing in current or waters that frequently fluctuate. Regardless of what you dress your jigs with, I couldn’t imagine a tacklebox without them. As always, let the fish tell you what they prefer, and keep jigging!